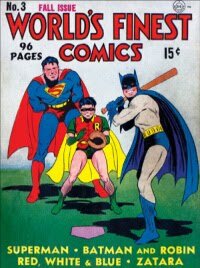 It seems only natural that the biography of a comic book artist should be told in a graphic book. Lily Renée Wilhelms was the 14 year old daughter of well to do Jewish parents in 1938 Vienna, Austria. The family had many friends in Vienna, but when Austria became part of Germany that year, they lost not just their friends, but eventually everything they owned. In 1939, Lily was invited to by her English pen pal to come live with them. She became part of the Kindertransport before it ended in September 1939. England should have been a refuge for Lily, but her pen pal’s mother turned out to be a rather cruel woman who expected her to do all the housework and shopping. She also neglected to feed her during the day, so Lily was forced to live only on high tea in the evening. Eventually she ran away and took work as a mother’s helper for various doctor’s families. But in 1940, England considered people of German and Austrian descent to be Enemy Aliens and they were placed in internment camps. Again, Lily was forced to run away, to London, where she is encouraged to turn herself in to the police. Because she is still a minor, Lily is again placed on another Kindertransport, this time to the United States. Sadly, up until now, she had no idea what had become of her parents, but she is told that her parents are in now New York, so when her ship docked, the family is finally reunited. Away from the war and the Nazis, the Wilhelms family begins to adjust to living in New York City. Lily works as an artist for catalogues, but soon her mother encourages her to apply for a job at Fiction House Comics. 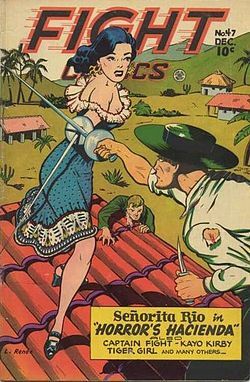 From there she worked her way up, from eraser to penciling a character named Jane Martin, to getting her own character, Senorita Rio. As a long time lover of comic books, I thought this graphic memoir was quite well done. The story of Lily's life was clearly presented, and there were short but thorough explanation of some of the events that impacted the lives of her and her parents. My only problem was the timeline. Sometimes, I felt I was led to think some of Lily’s experiences lasted longer than they turned out to be. At the end of the book is section called ‘More about Lily’s Story.’ This includes a short glossary of German to English terms that are used, followed by a section that gives the reader broader explanations of many of the different things in Lily’s world that they might not be familiar with, ranging from such topics as the difference between Nazi Concentration Camps and British Internment Camps to a description of the Automat, an inexpensive eatery that no longer exists. 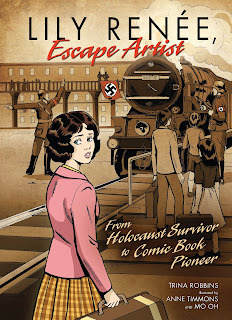 The artwork in Lily Renée, Escape Artist: From Holocaust Survivor to Comic Book Pioneer is excellent. The drawings are clearly and cohesively done, portraying the events that impacted the Wilhelms family, as well as their reactions. The colors are vivid and somehow seem so appropriate for the period this memoir covers. 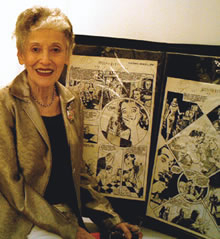 The author, Trina Robbins, is herself a comic book artist, one of the founders of the all-women’s comic book ‘Wimmen’s Comix.’ She is also a writer and historian of feminist pop culture. She is a co-founder of Friends of Lulu (of Little Lulu fame, my favorite comic book), which is dedicated to women and comics. 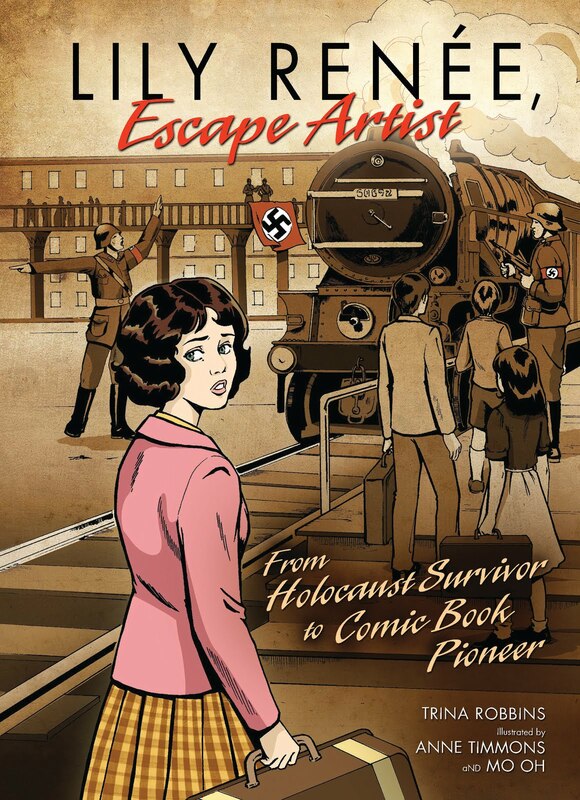 On the whole, I think that Lily Renée,Escape Artist : From Holocaust Survivor to Comic Book Pioneer would be an excellent story for middle grade readers who are curious or are learning about the Holocaust, and I would recommend this graphic biography to anyone with an interest. This book is recommended for readers age 9-12. The book was a received as an E-ARC from Netgalley.com. It will be released on 11/1/2011. Thanks for the heads-up! I will keep an eye out for it.